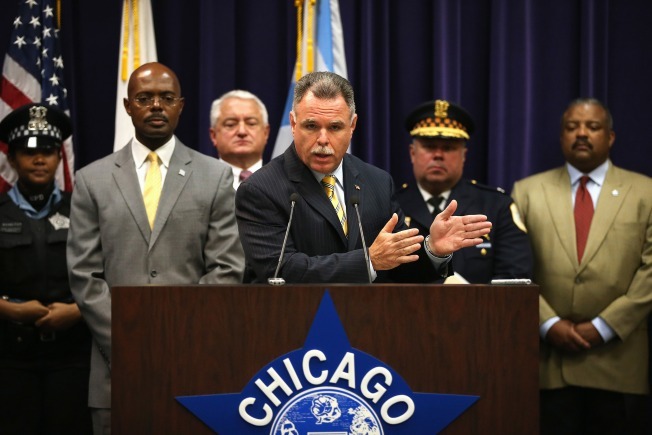 Police Superintendent McCarthy Joins Major City Police Chiefs for Summit on Gun Violence in D.C.
Chicago Police Superintendent Garry McCarthy will make the trip to Washington, D.C. Monday to participate in a summit on gun violence with several other police chiefs from major cities. The event was organized after police chiefs across the country noted an uptick in violent crime, particularly homicides, recently. According to Chicago Police, the purpose of the summit is "to identify the critical issues, craft potential strategies and solutions, and focus national attention on the problem." Topics of discussion will include the causes and factors that contribute to an increase in violence, including synthetic drugs and repeat gun offenders. The police chiefs will also discuss new approaches that can be implemented in the criminal justice system to decrease gun violence. The summit comes two days after Chicago Police released statistics showing that overall crime has decreased, but murders and shootings are up. McCarthy will be joined by police chiefs from New York, Los Angeles, Philadelphia and Washington, D.C., among others. The event takes place at the Newseum, located at 555 Pennsylvania Avenue.